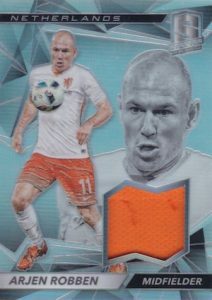 Although Spectra is relatively well-known with collectors of other sports, futbol fans get their first taste thanks to 2016 Panini Spectra Soccer. Bright and bold, the premium set includes five numbered hits per hobby box. Featuring quality card stock and opti-chrome Prizm technology, 2016 Panini Spectra Soccer offers wild designs and a mix of unique parallels. The set celebrates all facets of the sport with all-time greats such as Pele and Maradona alongside current superstars like Messi and Cristiano Ronaldo, as well as pushing into the future with young studs. 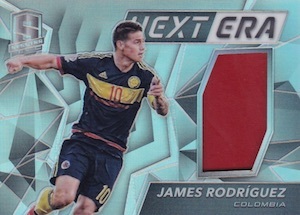 The 2016 Panini Spectra Soccer base set averages three cards per box and collectors can also find one base and one die-cut parallel from a group that includes Neon Blue, Green Die-Cuts, Gold (1/1) and Black Die-Cuts (1/1). 2016 Panini Spectra Soccer autographs incorporate several themes for a total of six signed inserts. This includes the base Signatures in addition to Global Icons and Illustrious Legends. Adding a relic swatch to the signature are Jersey Autographs, Superstar Jersey Autographs, and Young Stars Jersey Autographs. Each of these inserts will also have a variety of limited parallels. PARALLEL CARDS: Neon Blue #/75, Pink #/25, Orange #/10, Gold 1/1. DIE-CUT PARALLEL CARDS: Red #/65, Purple #/35, Green #/5, Black 1/1. PARALLEL CARDS: Red #/65 (*Cards #8 - #/40; #15 - #/50), Pink #/25, Orange #/10, Gold 1/1. PARALLEL CARDS: Red #/65 or less (*No card #30), Pink #/25 or #/15, Orange #/10, Gold 1/1. 10 cards. Serial Numbered #/45. PARALLEL CARDS: Neon Blue #/75 or less, Pink #/25 (*No card #18), Orange #/10, Gold 1/1. 42 cards. *Cards found only in parallels noted below. PARALLEL CARDS: Pink #/25, Orange #/10 or #/5, Gold 1/1. All subjects not included in Pink parallel. View specific options with the full spreadsheet. PARALLEL CARDS: Pink #/25 or #/15, Orange #/10, Gold 1/1. PARALLEL CARDS: Pink #/25 (No card #13), Orange #/10 (*Card #13 - #/5), Gold 1/1. 14 cards. Serial Numbered #/199. PARALLEL CARDS: Neon Blue #/75 or #/35, Pink #/25 or #/15 (*No cards #4, 35), Orange #/10 (*No cards #4, 35), Gold 1/1. 2016 PANINI SPECTRA SOCCER SEALED HOBBY BOX 5 AUTO OR RELIC EACH MESSI? RONALDO? 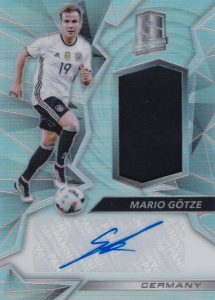 2016 PANINI SPECTRA SOCCER HOBBY BOX - 5 AUTOS MEM!